I decided to check out the new regular sized business card service Moo.com is offering, and I was sadly disappointed. At the moment, trying to make a set with more than 5 different cards causes the system to choke. 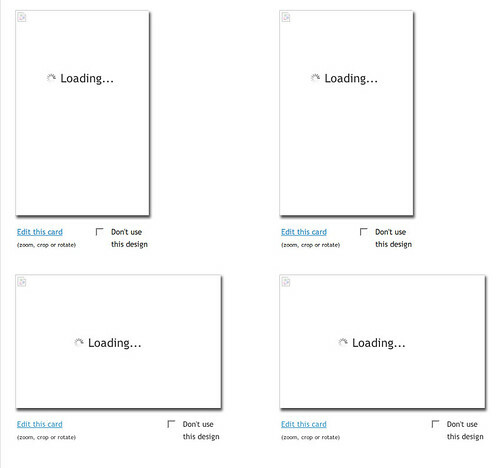 All you get is a screen with your cards forever trying to load (see above). This is odd, considering that you should be able to make a set with up to 50 different images. I have full confidence that they’ll eventually get this ironed out….but in the meantime? What a bummer! I wonder if it’s a matter of many people trying to upload a lot of images at once, or if they’re just not equipped with server space to really handle so many. yeah, one would think that…except all the images are served off flickr. So I really don’t know what’s wrong. Moo.com’s new business cards… why you should wait.